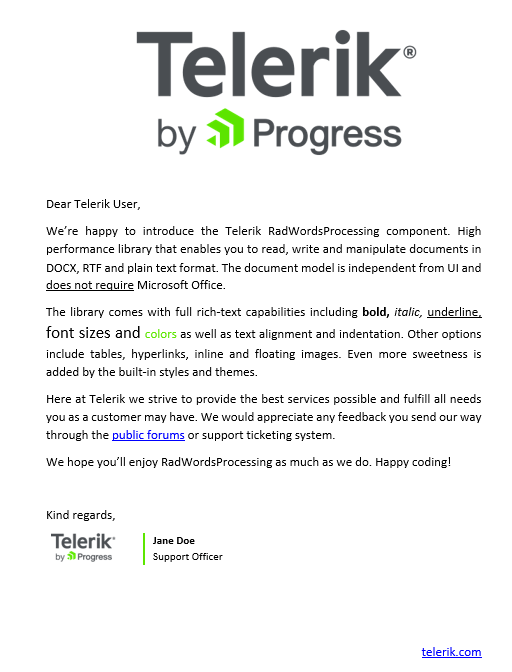 RadWordsProcessing is part of the Telerik Document Processing libraries. The full documentation for this component is available at https://docs.telerik.com/devtools/document-processing/libraries/radwordsprocessing. RadWordsProcessing is a processing library that allows to create, modify and export documents to a variety of formats. Through the API, you can access each element in the document and modify, remove it or add a new one. The generated content you can save as a stream, as a file, or send it to the client browser. Sections: You can customize the sections using the properties exposed by the corresponding class. The library provides support for customizing the headers, footers, and watermarks for a section as well. Paragraphs: The properties and methods related to paragraphs enable you to change its collection of inlines and appearance. Tables: An API for inserting, editing and removing tables. You can also change their rows, cells, appearance, and content. Images: Including inline and floating images. Fields: Merge fields, Document Variables and custom code fields, enabling you to insert any fields using its code representation. Breaks: Support for different types of breaks, so you can achieve the desired layout. Bookmarks: Inserting, modifying and removing bookmarks. Hyperlinks: You can work with hyperlinks pointing to a website or to a bookmark inside the document. Tab stops: Working with a tab stops collection for each paragraph. The document model includes a repository of Style objects which contain sets of character, paragraph or table style properties. The API allows you create custom styles and use them throughout the document. Mail Merge: Provides ability to produce personalized documents from a template holding fixed content merged with variable data from a data source (database or any other collection of data items). Merge documents: Insert a document into another one at the desired position, controlling the way the styles of both are merged. Import of document elements: Import a document element from one document into another. Clone documents and document elements. Replace: RadWordsProcessing gives you the ability to search for a string in a RadFlowDocument instance and replace all matches. The library also allows you to replace the styling of the matches alone. RadFlowDocumentEditor: It is intended to simplify the process of creating and modifying a document and achieve the same results as you would using the style properties and child collections of the document elements with less amount of code. Character formatting: Font size, font color, font name, bold, italic, underline, etc. Paragraph formatting: Line spacing, alignment, indentation, spacing before and after, etc. Table formatting: Enables you to change the alignment, borders, shading, spacing and padding, and more. Modifying the section properties to adjust the page size, orientation, margins, headers, and footers, etc. You can import and export documents of these formats as well as convert the format of the document.